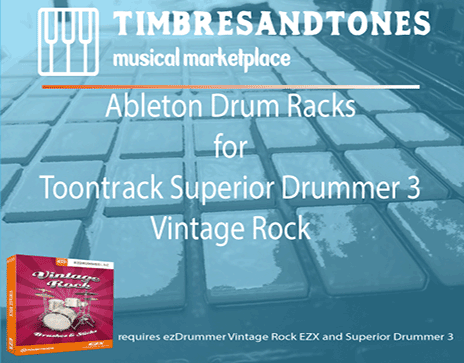 Ableton Drum Racks for Superior Drummer 3 Vintage Rock EZX by TimbresAndTones is Soundware (e.g. samples or presets that load into other products). Ableton Drum Racks for Superior Drummer 3 Vintage Rock EZX features separate Ableton drum racks for all factory presets for the Toontrack Superior Drummer 3 and Vintage Rock EZX library supplied with Toontrack ezDrummer. These racks are provide out of the box integration workflow between Ableton Live and Toontrack Superior Drummer using the Toontrack libraries including a host of features ready to use for composition and performance using Ableton Push or similar controllers. All factory presets are ready to go. Ease of navigation to load all Vintage Rock EZX factory presets from Ableton Push controller device browser. 5 Ableton Live templates designed to host the multi channel output routing presets with track level audio routing from Superior Drummer 3 into Ableton Live. SingleOut presets – 5 Ableton Drum Racks for all Vintage Rock EZX factory presets single audio output to a single Ableton track. Mixing can be further enhanced through Ableton track mixer by expanding out the track for individual pad and instrument level articulation, or loading additional Ableton audio effects to the track – for example the new Ableton 10 Drum Buss. MultiOut presets – featuring5 Ableton Drum racks for all Vintage Rock EZX presets in multiple audio channel output from the plug in to multiple Ableton audio tracks using the 5 multi output Ableton templates also provided designed for the kit presets. Track level audio mixing control in Ableton. Ableton Drum Racks for Superior Drummer 3 Vintage Rock EZX. 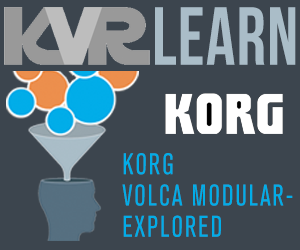 All macros and mult-track audio routing ready made with 10 supplied Ableton Live templates. Use the template racks and extend to your own Toontrack Superior Drummer 3 Vintage Rock EZX presets, swapping out individual sounds or articulations. You are 100% ready to go with the factory presets but there is no limitation to creating your own presets from these templates. Simply save a new drum rack based upon the modified TimbresAndTones template.